Understanding and interpreting the attention surrounding your institution’s research can help identify areas of strength or those that need improvement, meaning you can better tailor support to realize long-term objectives. Altmetrics give you and your faculty insight into what’s being said about your research as soon as it’s published, meaning you can ensure it’s being represented and interpreted correctly – and step in quickly if a issue occurs. Demonstrate the visibility and influence of your institution’s research to funders, alumni and governing bodies to highlight the value of specific programs or groups. Build a stronger case for future support and engage new sponsors. Compare the online activity surrounding your institution’s research with that of peer organizations. 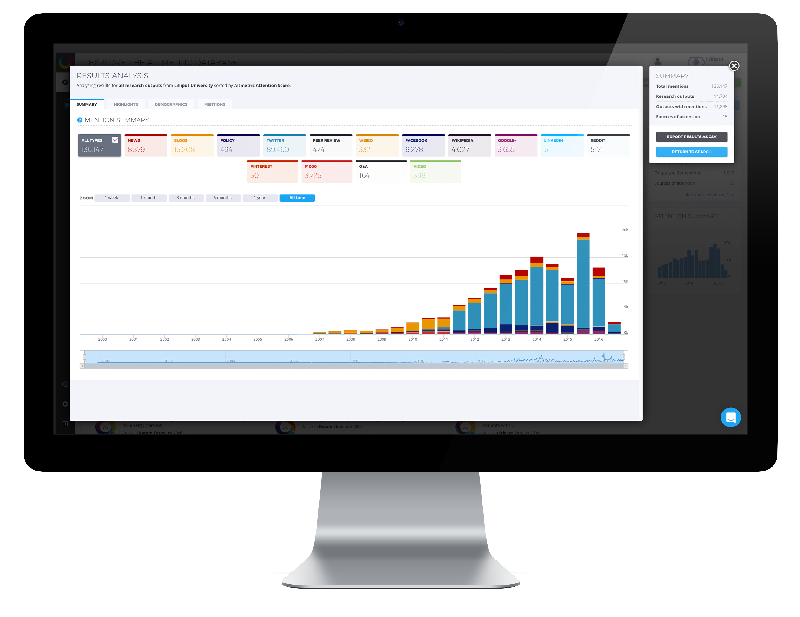 Monitor trends and track influence over time to provide management and boards with the latest insight into the dissemination and reach of your outputs. Build a more complete picture of the visibility and profile of an individual researcher to get better understanding of the influence and broader impacts of their work. Pick out highlights in attention and see where past projects have resulted in real-world application. Altmetric details pages provide authors an easily accessible, collated record of the online mentions and shares of their research. Users can browse all of the original posts and click through to view them at the source. Encourage your academics to sign up for email alerts to be notified when their research gets further attention. Real-time social media updates provide insight into how your faculty’s research is being shared from the moment it’s published. Demographic details show where in the world the people talking about their research are located, and the multi-channel overview makes it possible to assess and compare levels of awareness amongst target groups on different platforms. Altmetrics can help your researchers uncover evidence of societal engagement, influence and broader impacts to demonstrate the value of their research, including any recent publications that have not yet had a chance to accrue traditional citations, to funders and in their CV or academic profiles. 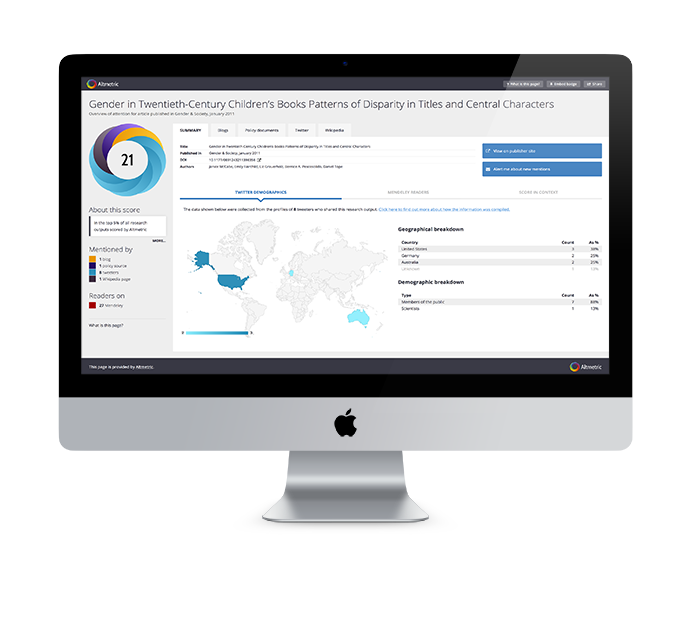 Our intuitive platform enables you to browse, monitor and report on all of the attention data Altmetric have collated, including that for research published by your faculty. Showcase the attention of your institution’s research by embedding the Altmetric badges in your institutional repository. It’s free to do in just 3 simple steps. 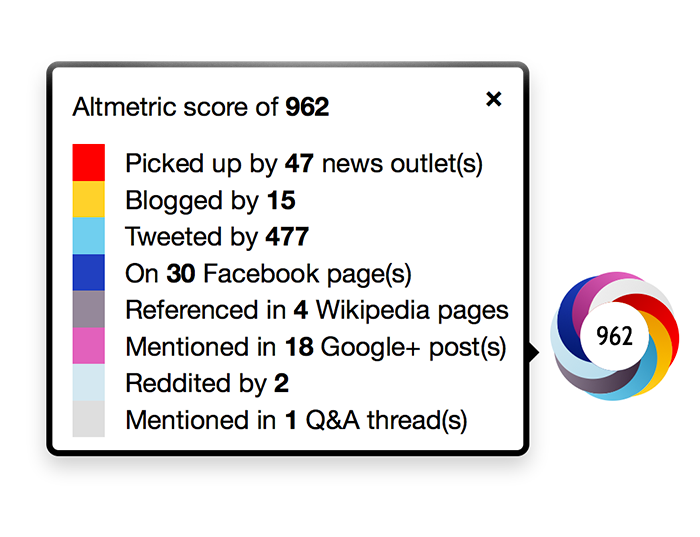 How are institutions using Altmetric data? Karl Leif Bates from the Communications Office at Duke University shares their motivations for using Altmetric, and discusses how they intend to utilize the data within their existing workflows. Scott Taylor from the Research Services team at Manchester University Library talks us through their experience of adopting the Altmetric for Institutions platform.